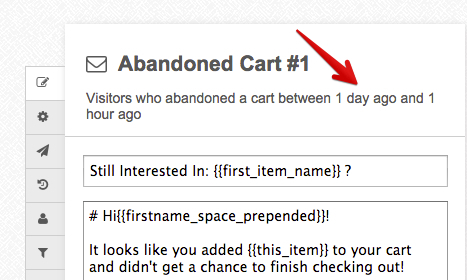 How long does it take for abandoned cart emails to be sent to customers? You can see how an email is configured in both the main dashboard as well as the rule edit page. For example in this screenshot, the first abandoned cart email is set to go out 1 hour after purchase. The actual window used is any time between 1 day ago and 1 hour ago - but for all intents and purposes this means it goes out 1 hour out. MageMail emails are sent every 30 minutes on a schedule, so to be precise, it will go out between 1 hour and 1:30 hours after the abandoned cart was last updated. Also, the first abandoned cart rule is set to ignore the sending window, so it will be sent 1 hour out, no matter what time of day it is. The second abandoned cart email you can see goes out 2 days out from purchase, and it uses the sending window. So for example if your sending window is from 10am to 2pm to maximize engagement with your customers, it will go out during that time, 2 days out from when the cart was last abandoned.